Home / Automobile / Engine / IC Engine / What is dual fuel engine? How does a dual fuel engine work? What is dual fuel engine? How does a dual fuel engine work? The engine is a very important part of an automobile. In the present time, many research is going on the engine to get maximum mileage and power at minimum cost. An alternative fuel is also required to run an engine because of higher cost and low availability of petroleum fuel (diesel and petrol). Many engines have developed which can run on an alternative fuel; one of them is a dual fuel engine. CNG and LPG fuel engines which are used in now days are dual fuel engine. Dual fuel engine is used because of the high cost of diesel. Dual fuel engine is a compression ignition engine. According to its name, it used two fuels to complete a power stroke. It is used gaseous fuel as the main fuel and diesel fuel as a pilot fuel. In these engines, a mixture of gaseous fuel and air is drawn into the engine cylinder. In the cylinder this mixture compressed. A big problem occurs to ignite this mixture because of gaseous fuels are not a good compression ignition fuel. So a small quantity of diesel oil is injected into the compressed mixture. As same as the diesel engine, this diesel fuel ignites due to temperature rise in compression. This fuel is known as a pilot fuel. This ignites the whole mixture of air and gaseous fuel and a rapid combustion take place inside the cylinder. 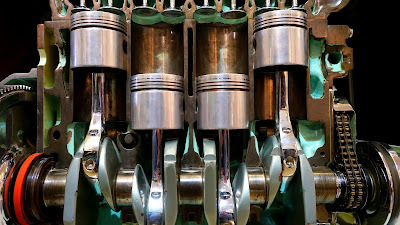 This combustion increase pressure inside the cylinder which forces the piston same as other engine and produces power. In a dual fuel engine, pressure rises suddenly which can generate knocking problem. So a predefined quantity of pilot fuel is injected. If we inject a large quantity of pilot fuel it ignites the mixture rapidly and makes the cause of knocking. how to convert a diesel engine into dual fuel engine? The design of the dual fuel engine is same as the diesel engine except in dual-fuel engine the air is mixed with the gaseous fuel in the inlet manifold and a small quantity of diesel engine is injected into cylinder chamber by the injector. To store and inject diesel fuel a pump and a tank assembly are also used in dual fuel dual. By these changes, we can convert any engine into dual fuel engine. 1. A dual fuel engine can run on both diesel fuel and gaseous fuel. 2. It is used gaseous fuels, which are cheap and easily available. 3. It is used gaseous fuels which are free from pollution. So it is an environment-friendly engine. 4. Because of clean combustion, it reduces wear and tear in the engine and also the requirement of lubricating oil. 6. These engines are very suitable for LPG and CNG. 7. It generates high power than diesel fuel at higher load conditions. If you like this post then don’t forget to comment on it. Thanks for reading it.